Completely rebuilt unit includes new rotor, bearings, seals, shims, TA breaking kit, dustshield, SS E-brake kit, new shoes, and lifetime warranty. 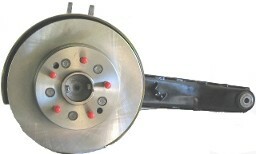 Sold less rotor and calipers. Available for left or right side and automatic or standard transmissions. Must specify configuration from drop-down lists above before adding to Cart. A core charge of $200 will be added to your order. This amount will be refunded once core has been received and inspected. Core must be rebuildable for full core charge refund and returned within 30 days.Ikerd's inc. warrants that all rebuilt Trailing Arms are free from defects in material and workmanship for as long as the original purchaser owns the vehicle on which it was originally installed. The warranty is void if the Trailing Arm is not installed properly on the vehicle for which it is designed. . Completely rebuilt unit includes bearing seals, shims, TA breaking kit, dustshield, SS E-brake kit, new shoes, and lifetime warranty. Sold less rotor and calipers. Available for left or right side and automatic or standard transmissions. Must specify configuration from drop-down lists above before adding to Cart. A core charge of $200 will be added to your order. This amount will be refunded once core has been received and inspected. Core must be rebuildable for full core charge refund and returned within 30 days.Ikerd's inc. warrants that all rebuilt Trailing Arms are free from defects in material and workmanship for as long as the original purchaser owns the vehicle on which it was originally installed. The warranty is void if the Trailing Arm is not installed properly on the vehicle for which it is designed.